The hotel is conveniently situated just near the beautiful Finsbury Park and on a short distance from the Emirates Arsenal Stadium, making the location a favorite one for football lovers, which often check in here on a match day. Finsbury Park Underground Station is only 5 minutes away so the bus and main line railway networks connect the hotel to Center London and London’s airports. In addition to this, it is a perfect choice for business men as the location is rather close to Alexandra Palace, Earls Court Exhibition Centre and Olympia Exhibition Centre. It is also accessible to the main touristic attractions, as the hotel is situated on A503 – Seven Sisters Road, which runs directly into the heart of London. The three star hotel facilities include a 24-hour front desk, a high speed free wireless connection, safe deposit, luggage storage, photocopy machines, lounge, snack bar and express check out. Also, the rooms are fully equipped and furnished. Moreover, the hotel puts into service a public bus, which you can use for transport anytime you want. In order to get rail transport from London Luton Airport to Best Western London Highbury you need to take the train from the Luton Airport Parkway Station directly King’s Cross St. Pancras station. The train comes every approximately half an hour and the journey takes about 30 minutes. From there, you can take the Tube for one station, which will take you to Finsbury Park Station, just minutes away from the hotel. London Luton Airport is 32 miles away from Best Western London Highbury. If you want to travel by car, you have to take the M1 road until Edgware, then the A1 Road which will take you to the junction of Holloway Road (A1) with Seven Sisters Road. Just after Finsbury Park Station, you should see in front the beautiful Finsbury Park. 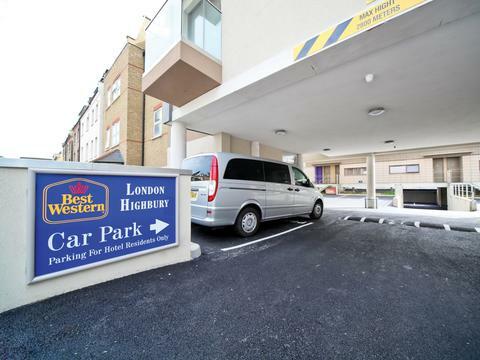 Best Western London Highbury is only a few meters away. 247 Luton Airport Transfer can always provide you with a minicab from London Luton Airport to Best Western London Highbury. The price for a saloon car is £46 and the journey can take up to one hour, if we include any traffic delays that may occur in rush hour time.